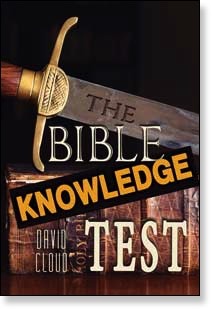 We are pleased to announce the publication of The Bible Knowledge Test in print and as a free eBook download. The Bible Knowledge Test is designed to challenge God’s people as individuals and as churches about their level of Bible knowledge. After 40 plus years of experience, I have concluded that though Bible believers love the Bible as God’s Word, oftentimes they remain ignorant of it. They might read it from time to time. They might even read it regularly, but they don’t understand it very well, because they aren’t Bible students and they lack the necessary training and tools for effectual study. Having preached in more than 550 churches in 49 states and more than two dozen countries, I have observed that a great many church members are not serious Bible students. They don’t write anything down during the sermons. Many don’t even look up the passages that the preacher discusses. They don’t have a serious daily Bible study habit. They aren’t keen to obtain and use tools such as dictionaries, commentaries, and other study books. One independent Baptist pastor recently challenged his people to read the Bible one minute a day. One minute! And that is a church that considers itself a strong Bible-believing church. What a dishonor to God to offer Him a mere 60 of the 86,400 seconds of my daily schedule for His holy Word. What an incredibly shallow age we live in! No wonder so many “conservative” churches are moving quickly toward a contemporary stance. The foundation is mere shifting sand. One fundamental issue underlying this problem is that so few pastors are serious Bible students. As a result, the people aren’t accustomed to learning much from the preaching and teaching. It is the pastor who is passionate about Bible study who can impart such a passion to his people. The Bible is God’s gracious, infallible revelation of Himself to mankind. It is the world’s most wonderful, thrilling Book. One chapter is worth more than all of this world’s gold and silver. It is in God’s Word that we find salvation, the knowledge of God, and the will of God. In the Bible we find the past and the future. We find light to understand every aspect of life. We get wisdom, spiritual strength, and victory over the devil. God reproves the believer who is not skillful in the Bible as a baby Christian, so this is no light matter. God says that every believer should grow strong enough in Bible knowledge that he can teach others. This means that the believer doesn’t know Bible truth well enough until he knows it well enough to teach someone else. “For when for the time ye ought to be teachers, ye have need that one teach you again which be the first principles of the oracles of God; and are become such as have need of milk, and not of strong meat. FOR EVERY ONE THAT USETH MILK IS UNSKILFUL IN THE WORD OF RIGHTEOUSNESS: FOR HE IS A BABE. But strong meat belongeth to them that are of full age, even those who by reason of use have their senses exercised to discern both good and evil” (Hebrews 5:12-14). This Bible Knowledge Test proves that a standard Bible Institute level of education is the very beginning of being of full age by the definition of Hebrews 5:12-14. To understand the Bible, one must learn the principles of Bible interpretation, Bible geography, Bible culture, Old Testament history, the law of Moses, the priesthood, the sacrifices, the tabernacle, the covenants, the life of Christ, Acts and New Testament history, Bible theology, defense of the faith (apologetics, cults, false teachings), Bible prophecy, and other things. Becoming skillful in the Bible involves owning and knowing how to use tools such as a study Bible with cross references, a Bible dictionary, a concordance, the Treasury of Scripture Knowledge, and some wisely chosen commentaries. We are not saying that it is necessary to attend a formal Bible college. Many churches today operate part-time Bible institutes. Further, with the tools available for self study, a Bible Institute education is within the reach of most English-speaking Christians who are willing to do the necessary work. We challenge every born again believer to take this matter seriously. Don’t be content to remain weak in Bible knowledge. By remaining in this condition, you are missing out on the richness of the Christian life as surely as a child who never matures misses out on the richness of adult life. Carve out some serious time in your daily schedule to study the Bible and the things of God. If your church has a Bible Institute, find a way to attend. If not, a good start toward a solid Bible education would be the following courses from Way of Life Literature: The Effectual Bible Student, Old Testament History and Geography, Bible Times and Ancient Kingdoms, The Four Gospels, Acts, and One-year Discipleship Course. Beyond that we publish many other Bible courses, including courses on Bible Prophecy, Theology, Church History, Job, Psalms, Revelation, Romans, James, and Hebrews. Jesus has promised that if we put Him and His will first, everything else in our lives will fall into its proper place. Stop putting your business before God’s Word and God’s will, and you will be amazed at how much more spiritually rich your life becomes. When I was a young Christian, I determined that I would never take a job that hindered my Christian life. I would not take a job that would keep me out of church or make it too difficult for me to spend time in God’s Word. By God’s grace, I never have taken such a job, and the Lord has provided every need and much more! That’s not “legalism”; that’s obedience and true discipleship! Thousands of believers have the same testimony. It is a matter of the priority of one’s heart. At the end of the Bible Knowledge Test we will give some suggestions for self study. Take the time to examine yourself by the following test. Are you of “full age” or are you yet “a babe”? Please understand that these are not advanced questions. They are very basic, in fact.